The latest addition to the rotation--and with the trade of Lohse and demotion of Belisle, the apparent #4 starter--is LHP Phil Dumatrait. Dumatrait has a rich pedigree, being the #1 selection of the Boston Red Sox in the 2000 amateur draft out of Bakersfield Junior College. Dumatrait began his career in the Gulf Coast League, and didn't pitch very much until he was finally promoted at 21 years old to Class-A Augusta, where he posted excellent numbers. A year later, in 2003, he was traded to the Cincinnati Reds along with a player to be named in exchange for Scott Williamson in the fire sale that followed the conclusion of Jim Bowden's tenure with the team. As almost seems typical of Reds pitching prospects, Dumatrait suffered a critical injury almost immediately after he was acquired, missing the entire 2004 season with a torn rotator cuff. 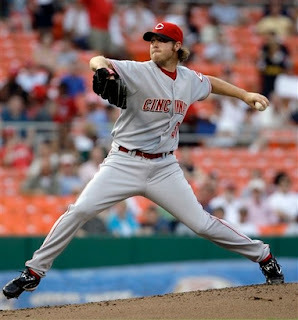 After his return, he spent the '05 season in AA and then arrived in Louisville midway through the '06 season. Dumatrait made his big league debut on August 2nd, allowing 6 runs in 3 1/3 innings and earning his first big league loss. Despite his first rounder-pedigree, Dumatrait's numbers look decidedly ordinary. His strikeout rate was well above-average earlier in his career, but has dropped steadily as he has moved up and at AAA has been below-average (by comparison, finesse lefty Bobby Livingston struck out 5.4 batters per nine innings at AAA this season). At the same time, Dumatrait's walk rate--while it has improved--remains fairly high. The one peripheral that looks solid is his home run-allowed rate, but his ground ball rate seems to have been steadily dropping over the past three years, giving little reason to think that he'll maintain low homer rates in the majors. He has produced a nice 3.49 ERA in AAA this season. But his BABIP is a bit low, and his FIP is about 0.7 runs higher than his ERA, indicating that he may have been lucky. Furthermore, he's already 26, so he probably doesn't have a lot of development time left. So, in short, there's unfortunately just not a lot that I see here that provides much hope for his future success at the major league level. Poor control, low strikeout rates, and average ground ball rates adds up to someone who is probably best suited as a long man in the bullpen, if he is to play int he major leagues at all. I hope I'm wrong. But if the Reds are counting on getting much production from this guy next season, they may be disappointed. Agreed; Astute Analysis As Always. All season, since his hot start in AAA, I've heard and read nothing but "bring up Dumatrait, bring up Dumatrait, he's doing so well at Louisville, he's ready for the majors," etc., and I kept looking at his stats to try and figure out what I was missing. One of my final thoughts before he got called up was "I look at Dumatrait's peripherals, and I weep for the future." I hope he does well, but he is certainly facing tough odds. There's a trail of tears lined with "maybe he's the next Jamie Moyer" lefties with low K-rates. Yeah, I think Livingston has a much better chance of pulling a Moyer than Dumatrait. At least Livingston does something really well--he has excellent control. That can go a long way.